If you are under the impression that a great-looking yard takes a lot of time to establish and you may never keep up with your neighbors, you’ll be delighted to learn more about sod installation. Sod is grown in local nurseries under the watchful eye of seasoned gardeners. After the grass reaches maturity, it’s cut into pieces or rolls and delivered to local lawns by Duval Paving, LLC. From there, it is laid down, and wallah! A stunning lawn from day one. Duval Paving, LLC has been delivering lush, green sod of all varieties to area homes and business properties since 2011. If you have grown tired of waiting for seeds to sprout, or haven't had luck getting them to take hold, give us a call at (904) 201-2161 for a sod quote. Instant beauty is the most compelling reason why home and commercial property owners call Duval Paving, LLC for sod delivery and lawn installation services. Depending on the size of the project, you can be enjoying your new lawn in just a few days after contacting Duval Paving, LLC. Since sod is nursery grown, it won't be riddled with weeds. Your picture-perfect lawn is ready to unroll or lay for backyard barbecues, house parties or even potential home buyers. With the fantastic benefits of sod installation vs. growing a lawn from seed, you’re likely wondering about the cost of the service in comparison with seeded yards. In addition to taking much longer to become established, seeded lawns require much more attention and patience and water to look great. You’ll need to prepare your soil for long-term success by aerating and nourishing it with fertilizer. Add in the pricing for seeds and weed killers. Duval Paving, LLC has been installing lawns for 8 years. 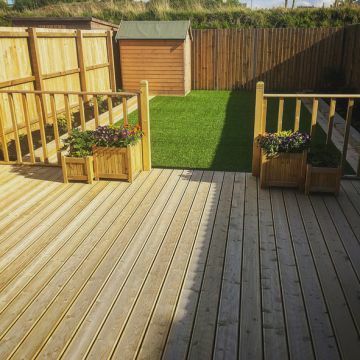 When you employ our services, you don’t need to buy a bunch of garden products to achieve a great looking yard. You will likely find that installing sod is more cost-effective in the long run than establishing a lawn from scratch. Call us at (904) 201-2161 to learn more about our sod services.